Alexandria Oratio Cortez (AOC), 29 years old, newly elected Congress Person from New York, one these little tyrants representing 700,000 of us, has suggested the New Green Deal, and, generally, has not hesitated to tell truth to power. Excellent. It even looks democratic. Meanwhile, satanic power (plutocracy) shall tell the truth to all the other 700 little tyrants out there, who lead the USA (and the world) into the sort of hell only plutocrats and their obsequious servants enjoy. AOC is too young to be president. However, Senators Elizabeth Warren and Sanders are running. 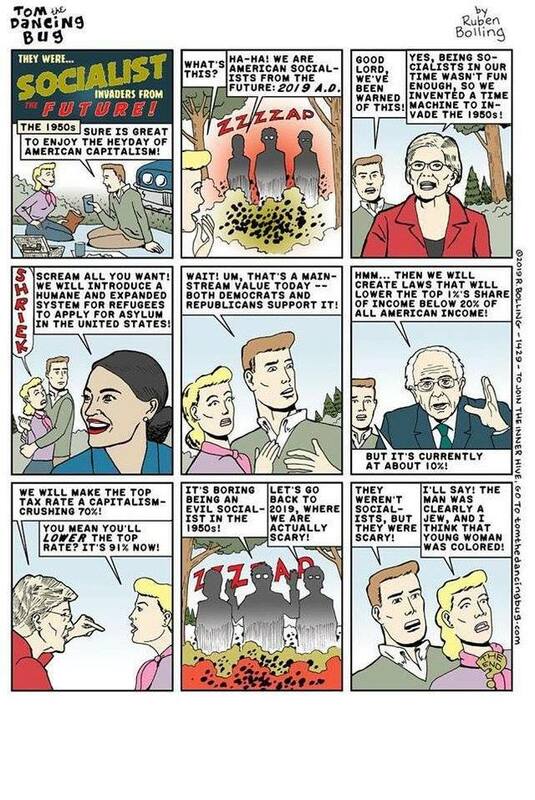 Warren, the blonde represented in the cartoon below, ex-Harvard Law professor, is derided as “Pocahontas” by Trump (long story), because she has some Native American ancestry. In my opinion, her proposed program is the bare socialist minimum. it’s significantly less than what was the governmental mainstream for US Republicans in the 1950s (see cartoon for a few glimpses). It turns out that the USA, by today’s US standards, was a socialist country in the 1950s. I have said that many times in the past. I am happy that this notion is reaching the mainstream, to the point cartoons are made about it. The ignorant will retort the USA is not a socialist country. And of course, they would be wrong. They are talking in prose, and don’t know it. The USA is a socialist country. Just look at Social Security, Medicare, VA, Bank Insurance, Unemployment Insurance, etc… All countries are more or less socialist, as they are all, more or less plutocratic. Even Trajan’s Rome, was partly socialist. What is revealing is that the plutocratic ideology has progressed so much, it has become an evidence. For example in France the nominally left government of Macron wants to privatize the airports of Paris (ADP). The airports are profitable, but the Macron types love their privates, because privates pay their elitist kind more. Privatizing airports is an idea that would be considered crazy right-wing in the USA. For example, in the San Francisco Bay Area, all the bridges and airports are (local) government property. However, plutocracy sloshes around the globe like a never-ending tsunami of moral devastation, intellectual dissolution and freedom degeneracy. Once ADP has been privatized, in “socialist” France… the, argument can be used that even “socialists” privatize airports, the sky is the limit. REPUBLICAN President Eisenhower brought up the top tax margin rate from 91% to 93% (DEMOCRATIC president Truman had put it at 91%…)… Also Eisenhower built a giant freeway system, which is still indeed, free, and used the army to enable all children to get desegregated education. Earlier the GI Bill had insured that 16 million GIs get a free university education, up to whichever level, paid by the government. It’s really telling that Warren and Sanders rather modest proposals are viewed as rabid Marxism. The chairman of the Federal Reserve bank just pointed out that the WORKFORCE PARTICIPATION RATE is the lowest ever. He concluded that an important part of the young US population has fallen out of the economy, not to say the society. Then he pointed out at the deadly opiates and benzodiazepine epidemics. and added, implicitly, that it looks as if they were falling out of life too. He didn’t mention the reduction of life expectancy, since Obama’s reign. But he could have. That the chairman of the US central bank points out that the US socioeconomy is dramatically malfunctioning to the point of causing the unemployment and the death of millions is unprecedented. Veering away from socialism and democracy, while plunging into plutocracy was the drama of Rome, and why Greco-Roman civilization failed… And many others. Even the grandson of Genghis Khan, having seized Baghdad with his Mongol, Frankish Armenian and Georgian allies said as much to the Caliph he was soon to crush inside a carpet. Putting plutocracy back in its place is a matter of survival for civilization, hence the biosphere, not just justice and optimizing happiness over the many. To get there, we have to reset the global mood. When Obama was president, he professed his admiration for Reagan. What he forgot to point out is that Reagan and Bush Senior were more left than Obama. Faced with a financial crisis of smaller proportion, the Saving & Loan crisis, Reagan and his VP and Successor, Bush Senior, nationalized 2,500 banks. Faced with a much more severe crisis, caused by the Clinton deregulation of finance, Obama nationalized none. It’s high time that the democrats stop being demoncrats, plutophiles like Obama’s VP, Biden, and, instead of selecting candidates who can be elected, select candidates who talk truth to power and about power. AOC said as much. La vérité sort de la bouche des enfants. Yes, there is less racism now than in the 1950s. At least in the USA. That implies that progress can, and did, happen (and it happened most when Marxist US president Eisenhower sent the troops to enforce school desegregation; the Rosa Parks bus thing was just a sideshow). But progress on skin color has been used obsessively to mask the regress of the devolution of power to just the few who (mostly) inherited it (yes, even Bill Gates). Want progress? Learn to apprehend the truth, first. This entry was posted on March 19, 2019 at 11:47 pm and is filed under Socialism, Systems Of Moods. You can follow any responses to this entry through the RSS 2.0 feed. You can skip to the end and leave a response. Pinging is currently not allowed. It is a quibble, but having social programs is not socialism, defined in economics anyway as state ownership of the means of production. For an update on how some of the models AOC likes to point to, Denmark and Finland, see https://www.zerohedge.com/news/2019-03-14/denmark-state-unreported-collapse (Denmark) and https://www.zerohedge.com/news/2019-03-12/finlands-government-collapsed-under-weight-socialized-healthcare (Finland). IMHO opinion, following others, the problem is the republican form of government. Asymmetry of interests of the elected rep’s and the people, the same old story: the rep’s get bought off to cut favorable exceptions for the Plutos, while over-promising to the People to gain votes. It’s all transactional. A plutocracy can superficially be a “capitalist democracy” or “Communist”. Yes, direct democracy helps; but not always, as with Cali’s Prop 13 which created a hugely unfair housing market. Interesting. Will answer more later, no time now. “Socialism” as the ownership of the economy by the state??? One has to define “state”… Was the Khmer Rouge the state? or Mao, or Lenin, the “state”??? I define “socialism” as the set of all social programs, such as free education… “Social programs” being defined as those not responding to a profit motive profiting only a few… Not all… That makes the Carolingian empire somewhat “socialist”, as basic education was free, universal… The Roman Republic army was “social”… But not the armies of the later Republic… And not those of a plutocracy (as they serve only a few). The problem is: AOC doesn’t apprehend the truth. Her signature policy, the Green New Deal, is a lousy way to spend $90 trillion to combat climate change. The world would be poorer and the problem wouldn’t be solved. She isn’t animated by a desire to crush plutocracy, but sees through a crazed intersectional oppressor-oppressed lens. Her Maoist tilt towards iconoclasm and hostility to civilization should disturb us all. She is a preacher of a fundamentalist cult. Taming plutocracy is a defining challenge of our era. It has less to do with redistributing wealth than dispersing power. Big tech is colluding with the powerful to rig the next election. Unless their power is checked now, American democracy is over. Amazon, Apple, Facebook and Google easily have power to throw an election by manipulating the public. Employing AI and ML, they’ll shame the efforts of traditional media to do the same. As power has left citizens and the states and concentrated in Washington, our politics have grown more corrupt and less democratic. Part of real reform would see this power returned to individuals and families, and local and state governments. And with greater accountability and transparency at each layer. Switzerland is a model here. To confess, I have not looked at the details of the New Green Deal. I am suspicious of draining funding away from research… All I know is that we need more fundamental research… Especially with Thermonuclear Fusion. We can’t depend upon wind, solar, batteries and hydrogen alone…. Fusion is clearly at the tipping point of commercial feasibility, and one doesn’t spend enough on it…. You seem quite hostile to AOC… whom I have not studied enough to criticize or defend… Let’s say she looked good at first sight to me. But I may be wrong. It’s true: I have become increasingly hostile to AOC, whom I now consider a glib know-nothing, with a penchant for gross hypocrisy and an appetite for power. A sassy social media presence isn’t a substitute for gravitas or wisdom. You are far more knowledgable than I am about French politics – would a referendum system integrate easily or require significant changes? The UK’s system was not built for them. Hence, the current crisis. The obvious alternative would have been one of their parties campaigning on Brexit and, if victorious, fulfilling their mandate. Instead, they have two zombie parties, both plutocratic and contemptuous of the people, and both interested in neither Brexit nor making the EU functional. Political participation and economic participation often go hand-in-hand. One must feel that they are part of a society for them to care about the maintenance of that system. And to add insult to injury, deprived of meaningful work, half the country is then berated as being racist, deplorables. There is danger ahead if this continues. And yet the 2020 Democrats are all signalling their desire to intensify this. Britain got where it is because lying Pluto media were allowed to run amok unrestrained, ever more. Those were often paid by global plutocracy, all the way to Moscow. Also increasing exemptions have made Britain believe it could get away with anything, ever more. Hubris, too, from being poorer than Italy to crowing about being wealthier than France… The whole thing to be inverted speedily…. Make America great again by returning to the past principles once held by most in the 1950s would be a good start rather than Trump’s empty rhetoric. Memories are so short and education so poor that many today have no understanding of progressive taxation. Media shills cry out that AOC wants to tax all income at 70% when it is clearly not the case. Wealth worship has twisted their minds to where they are unable to understand the corrosive effects of outrageous wealth. The public has been propagandized into the trickle down economics neo-liberal mindset even though it is not helping them. Both major political parties are captive to plutocratic donors and the looting of the general population continues. AOC is at least getting the message out no matter how much she is smeared by pluto media. Yes, it’s pretty amazing. Over the weekend, I met a (registered) Democrat who went on in a rampage against AOC. He also hates Trump. Both at the level of generalities. He didn’t like the Mueller report, as he was sure Trump was a Putin drone… All hallucinations, but they read it pushed on their phone, so should be right… He was so agitated I let him be.